We have three reveals from Asia: a Neutral Dragon, the Warrior Loa and a Druid spell! We were all waiting to see some Dragons from Rastakhan's Rumble and here is one. Perhaps Crowd Roaster isn't as exciting as you'd expect, but it's still a decent card. It has worse stats than Blazecaller, but damages for more and has the "holding a Dragon" condition instead of the "play an Elemental" one. The Warrior Legendary Loa was revealed by Ttkp on Weibo. And here we thought Warrior was going to be all about Dragons this expansion! Akali is a bit of a slower card, but if its Overkill triggers, it can be very powerful. 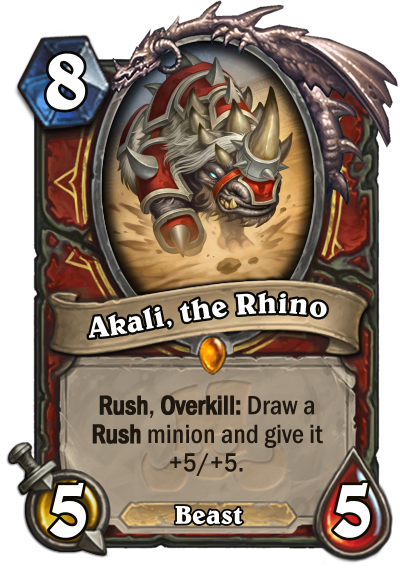 The problem is that it needs more Rush cards support, since Rush Warrior isn't exactly a top tier deck. It should be noted that Akali can both pull or be pulled by Oondasta. The last card was revealed by Hearthstone TH. 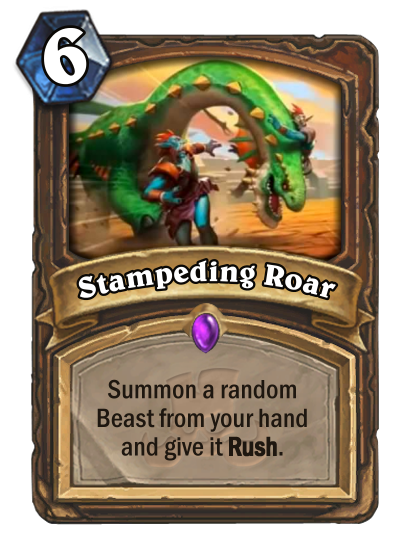 So, it looks like Druid is going Big Beasts this expansion. This can work as a tutor for Tyrantus, Hadronox, Ultrasaur, the new Ironhide Direhorn and Oondasta. Add all of these in a deck along with Stampeding Roar, Predatory Instincts and Juicy Psychmelon for maximum tutor value and you might actually have something. 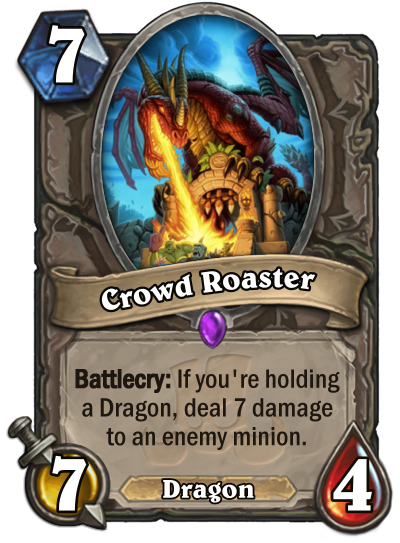 Crowd Roaster might be a part of Odd Warrior with the other dragon synergy card. If you’re playing a dragon-based deck, meeting the dragon in-hand condition shouldn’t be a problem very often. So is 7 mana 7/4+deal 7 to a minion good? Comparison with Blazecaller is ok (extra stat, 2 more dmg, not that much difference between 4HP and 5HP by turn 7, so main downside is not being able to go face with the dmg) but Blazecaller doesn’t see much play. Comparison with vilespine is less good (you probably wouldn’t want to swap 2 mana for 4 attack very often on a non-rush/charge minion, and vilespine is cleaner if there’s something like a mountain giant or lich king around), but vilespine is insanely strong. Overall it seems fair but that’s often not enough. It does fill a mana slot between bone drake and primordial drake though. Did someone say Akali? I definitely heard Akali. @Bozonik Blazecaller is a 6/6, so this guy has one less stat in total, and 2 less health stats. Now, Blazecaller doesn't see much play, because elemental shaman and mage aren't very good. So this guy depends on whether odd dragon warrior will be at least Tier 2. Because odd warrior really needs some single target removal, people even play Big Game Hunterand Tinkmaster Overspark. There is the 3 mana execute guy, and the new 5 mana armor gain dragon. And one of the 9 mana neutral dragons is always welcome, maybe even more than one (Ysera and Alexstrasza are biggest candidates). Odd Warrior is already has an okay shell to build on. I think it might be interesting to try. Ah, in my head Blazecaller was a 5/5 hehe. Overall, whilst it’s not a bad card, it’s a bit too close to fair for a synergy-based card imo. Similar to stuff like Bone Drake and Blazecaller. They’re not good enough to make their archetypes good, but might see play if the archetype already works without them. 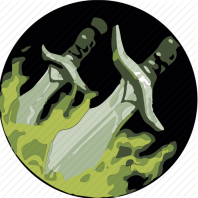 It potentially can be used in dragon decks to replace better single target removal in order to up the dragon count (e.g. in place of a Death in a dragon priest). Like you say, it could slot into an odd dragon warrior. But equally, the 3/2 execute guy seems much better from a removal point of view. And to be honest I’m not convinced this is even better than BGH, though I guess the flexibility of being able to kill smaller stuff with it is helpful so a bit meta dependent.